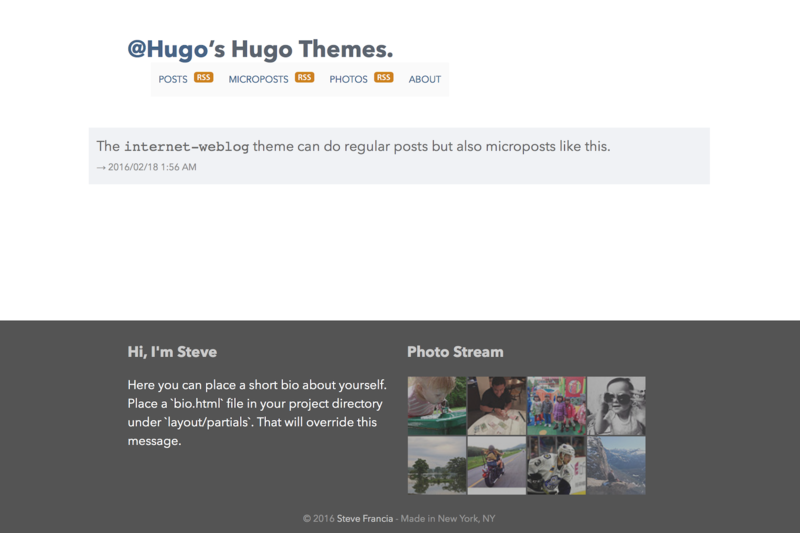 A personal, minimal blog theme for Hugo. internet-weblog is a minimalistic (and a bit responsive) Hugo theme that offers a traditional blog mixed with a microblog and a photoblog. It also offers the ability to do simple link posts that link to a remote page. It was ported from a theme made for Octopress. To see more, check out my blog which is rendered with this theme and see it’s configuration on Github. Where Should Blog Post Markdown Files be Stored? For more information read the official setup guide for Hugo. It also assumes you want to display links to your sections of content (posts, microposts, photos) and display links to other pages in the menu and requires some setup on your part. This guide will take you through the steps to configure your blog to use the theme. Recommendation: Organize your blog posts under the posts directory. As mentioned above, this theme takes a simplistic approach to menus. In fact, it doesn’t really support custom menus opting to just use Hugo’s main menu. Because it uses the “Section Menu for the Lazy Blogger” you’ll need to make one change to your config.toml file. Add main as the SectionPagesMenu. Because of this, your individual posts don’t need to organize themselves into menu groupings. Everything is assumed to be grouped at the top level. One exception to this is if you want to add a custom page to the root of the menu. In this case you would want to add menu: main to your page’s Front Matter. If you aren’t sure of how this should look, see how jnjosh.com uses this in it’s config.toml. Recommendation: Add SectionPagesMenu to your config.toml file. Recommendation: Don’t set a menu in your post’s Front Matter unless you want it to display on the navigation. Recommendation: Customize the menus that get an RSS icon by adding the RSSSections parameter to your config.toml file. Recommendation: Configure the menu items by adding menu.main sections to your config.toml file. FirstName = "<Your First Name>"
LastName = "<Your Last Name>"
AboutPage = "<The relative or complete link to your about page>"
FlickrID = "<Your Flickr ID>"
Recommendation: Don’t use the author variable, use the above [author] section in your config.toml. There are a few entry points for you to customize built in. The most important one is the bio.html partial. The contents of this file are displayed in the left side of the footer. To customize this, add a bio.html file in your site’s directory under layouts/partials. More details about each of these overrides are below in the overrides section. Recommendation: Add a layouts/partials/bio.html file to your site that tells your readers about you. These posts are rendered slightly different with an → to signify that it is remote. title internet weblog No. Unless you want to call your blog something else. SectionPagesMenu main Yes. See above. [author] - Handle A short handle to describe you. This could be your twitter handle or simply your first name. Yes. This is used to generate the Site’s Title. [author] - FirstName Your first name Yes. This is used in the footer to say Hi and in other places to identify you as the author. [author] - LastName Your last name Not really. It is used in some places to identify you as the author. [author] - AboutPage /about or http://about.othersite.com Only if you want an about page. This is exposed to allow you to link to an external about page as well. If you have a local page it can just be something relative. [author] - Location Your City No. If set, this is added to the Copyright in the footer so you can give some love to your hometown. [author] - FlickrID Your Flickr ID No. The footer shows your photo stream from flickr. If you don’t set it, nothing will be displayed. [params] - Description Describe your site No. If set, this is added to your pages metadata. [params] - ShowCopyright true or false No. If true, Copyright text will be added to the footer. [params] - RSSEnabled true or false No. If true, RSS pages will be generated. [params] - RSSSections [ "Posts", "Microposts", "Photos" ] If you want RSS links in the menu, yes. These strings need to be the display name of the section where you want to have an RSS icon displayed. [params] - RSSMicropostTitles true or false No. If false, Microposts RSS feeds will not have the title in included posts. If not present or true, nothing happens. [params] - YearlyMicroposts true or false No. If true, Microposts will have a page with a yearly grouping just like the posts. If not present or false, the default of not having a micropost yearly grouping is applied. [params] - SummarizeMicroposts true or false No. If true, Microposts will be summarized in the main list just like posts with a continue reading link. If not present or false, the default of not summarizing microposts is applied. Description = "This is my blog, read it and enjoy." The theme expects you to override a few files in your blog to finalize the customization of your blog. Below is a list of the files you can override and why you’d want to. To override these, create your own version of the file under layouts/partials—you may need to create this directory. bio.html The footer of the blog features a section about you. Yes. Otherwise it just has default text. not_found.html If you want to customize the 404 not found page, you can update it here. Probably. The default is pretty plain. Did you find a bug or have an ideas for new features? Feel free to use the issue tracker to let me know or make a pull request. This theme makes use of the following 3rd Party Libraries. lightGallery v1.2.14 - Used in page footer to provide a gallery to view photos in the photo stream. This theme is released under MIT. For more information, please see the License. This is the first theme I’ve made for Hugo, so I’m sure I’ve done some things wrong or assumed too much. If you have ideas or things that should be fixed, please let me know. Thanks to Steve Francia for creating Hugo!